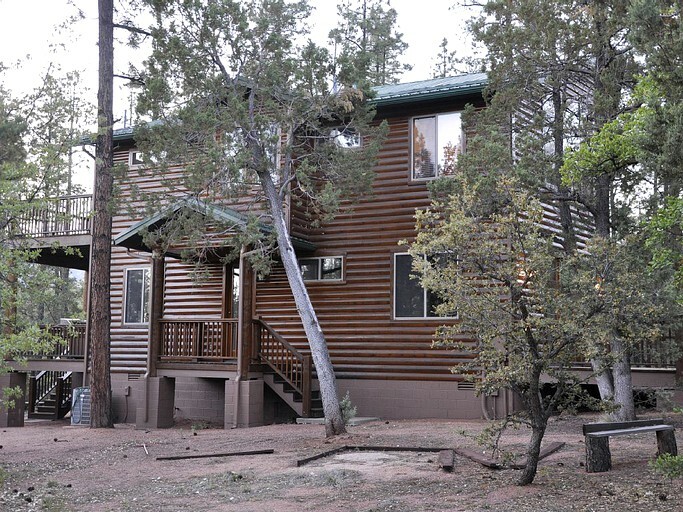 This 2,400-square-foot woodland log cabin rental boasts Mogollon Rim views and is located in Payson, Arizona. 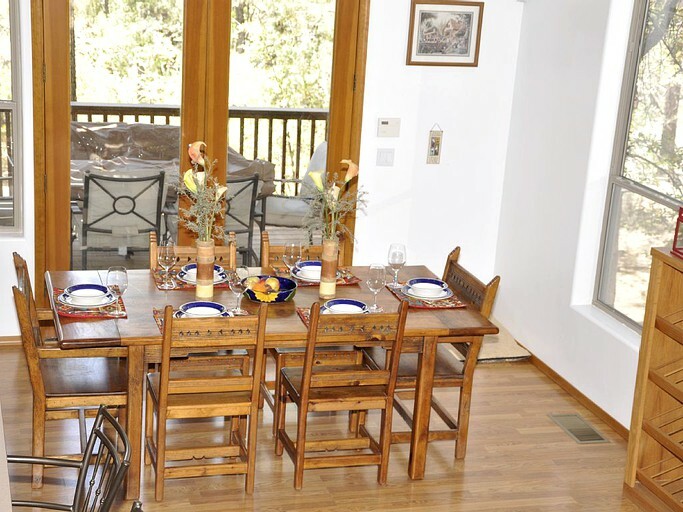 It can accommodate up to ten guests and is made up of three bedrooms and three bathrooms. 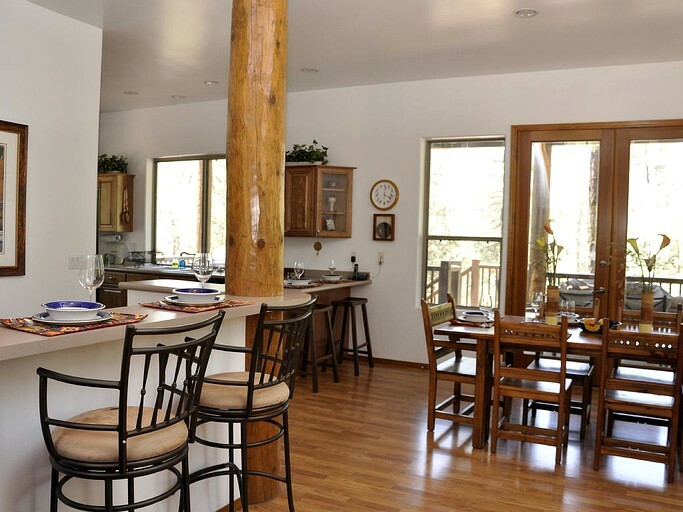 Comprised of two floors, this cabin has a living room, dining area, a fully-equipped kitchen, a games room, and a laundry room. Outside, there are also three exterior decks, adding an extra 9000 square feet, with outdoor furniture to relax and take in the beautiful scenery. Here guests will also find an outdoor barbecue to enjoy in the warmer months. 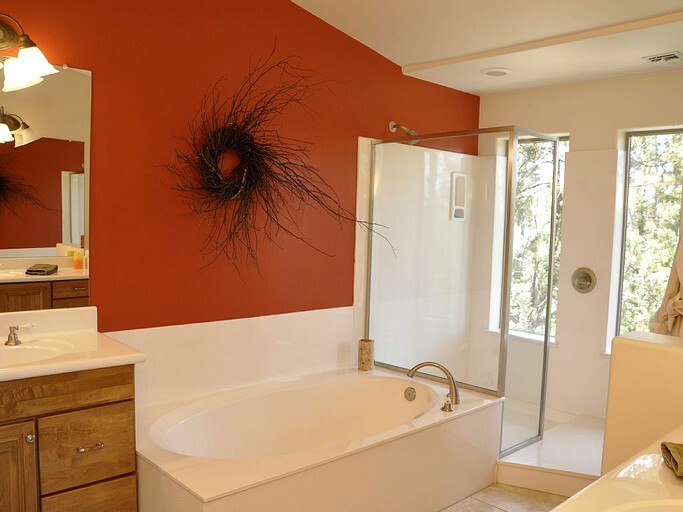 The property is fitted with central heating and air conditioning—the latter is rarely needed! It also provides plenty of outdoor parking space for cars, trailers, or RVs. 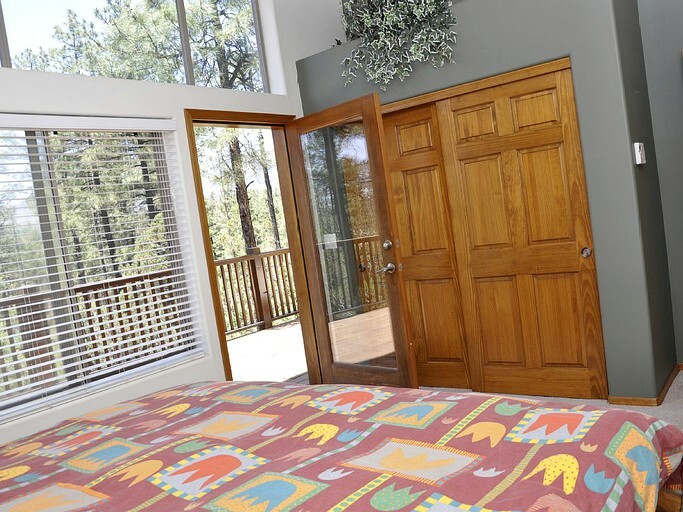 All of the bedrooms are situated upstairs on the first floor, with both the master bedroom and the guest bedroom sharing a 300-square-foot balcony looking out over the Mogollon Rim. 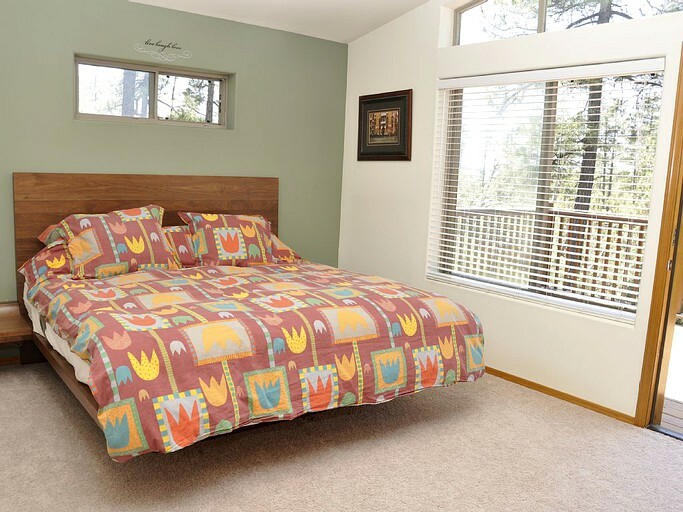 The master bedroom of this luxury cabin features a custom-made king-size bed, which appears as if it is floating, as well as its own bathroom, boasting excellent views from the bathtub and shower. 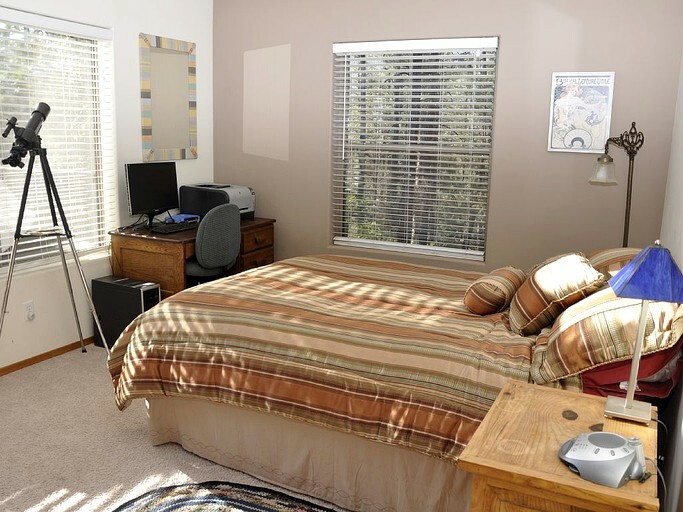 The guest bedroom has a queen-size bed and a desk with a computer, and the third bedroom is made up of two twin beds. 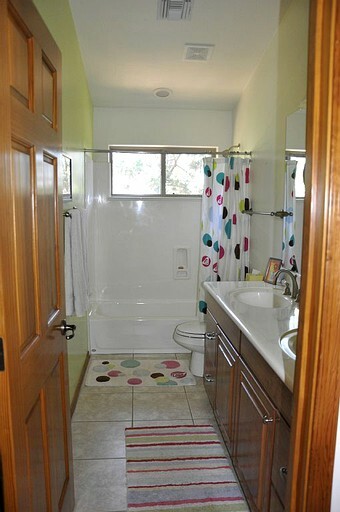 The two guest bedrooms share one bathroom on this floor, each with a toilet and bathtub/shower. 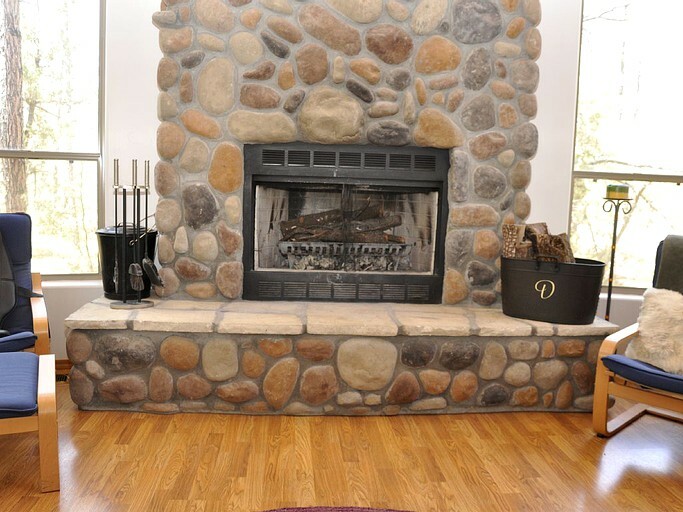 On the ground floor, the spacious living area offers two sofas, which can be turned into queen-size beds, and features a large fireplace stocked up with plenty of wood! The lounge area is equipped with a modern TV and stereo, and the many windows let in plenty of natural light, as well as giving some superb views of the outdoor scenery. 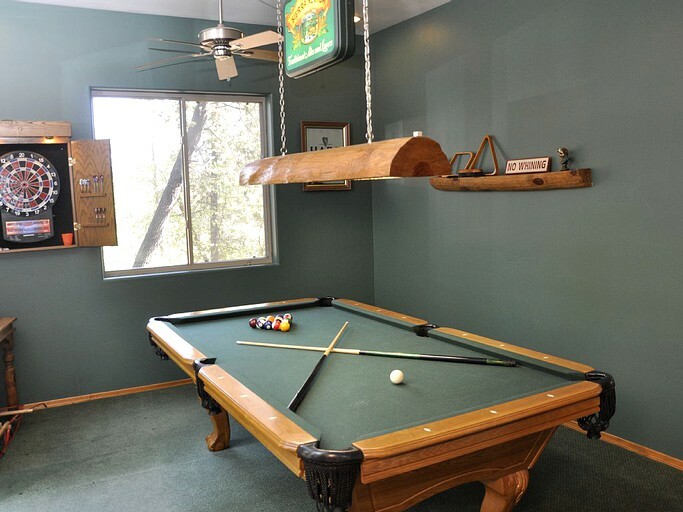 This rural property features a game room with a pool table and a darts board. Guests will also find a laundry room with a washing machine and a dryer, plus a closet full of games to keep them busy! There is an open plan kitchen-dining area which comes with all the necessary appliances and fixtures such as a refrigerator, an oven, a gas stove, a toaster, a dishwasher, a coffee machine, a microwave, and dishes and utensils. Guests can find the kitchen fully stocked, with pantry items, and a Vitamix! 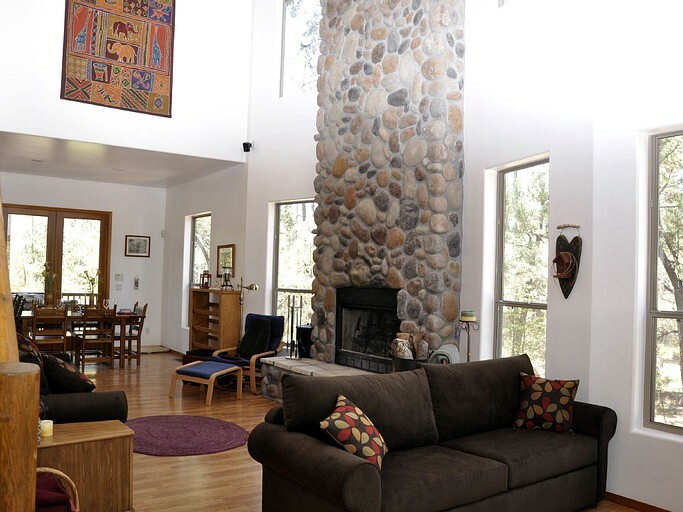 This modern, secluded property has all of the luxurious amenities to make for a comfortable stay in the woodlands of Arizona. 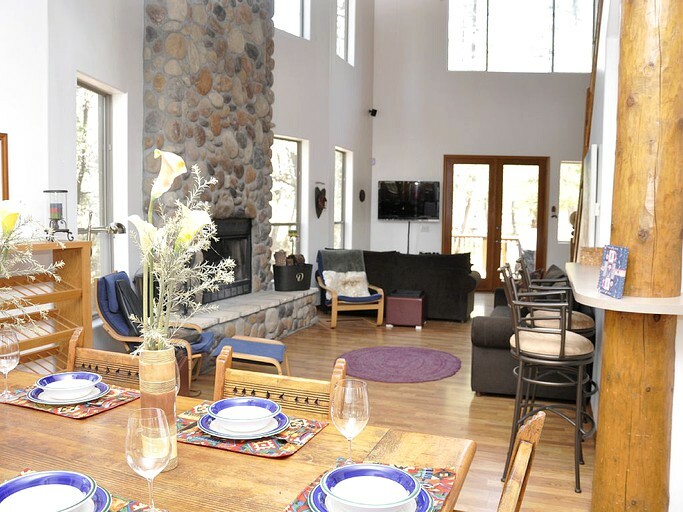 It is set up with high-speed internet, DirecTV, central heating, air conditioning, and a telephone to call any number in the U.S., as there is limited cell phone coverage. The living room includes a modern television, DVD player, stereo and a fireplace - with plenty of wood, for a cozy night in! The laundry room is fitted with a modern washing and drying machine, plus a closet full of games to keep guests occupied. 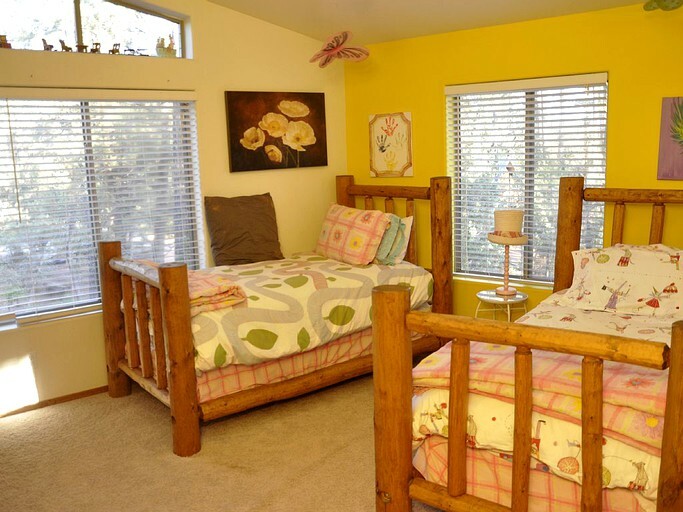 Additionally, the property offers a games room, decked out with a pool table and a dartboard. 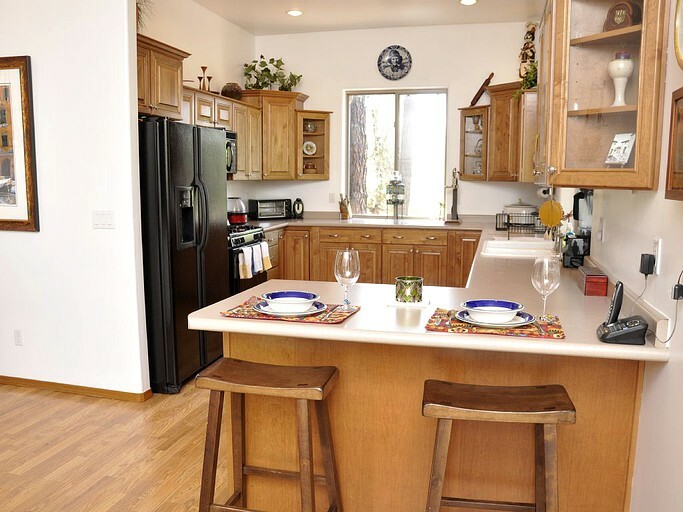 The cabin comes with a fully equipped kitchen to fulfill all of their cooking needs. 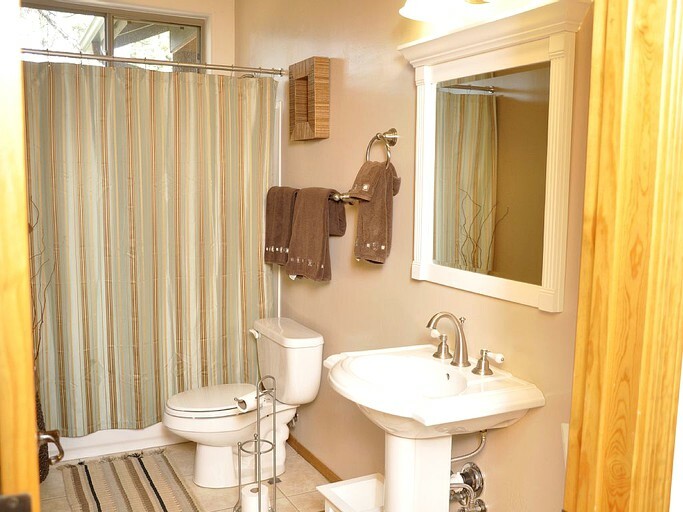 Guests will also find towels, linens, and a hair dryer provided, to use free of charge throughout their stay. 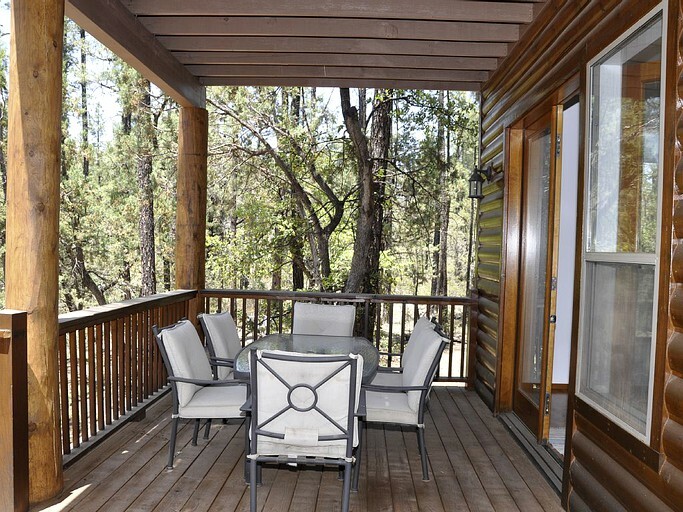 This bright, open cabin covers 2,400 square feet of living space, plus it offers an extra 900 square feet of outside decking space, with comfortable furniture from which guests can enjoy the sun and the magnificent surrounding views. 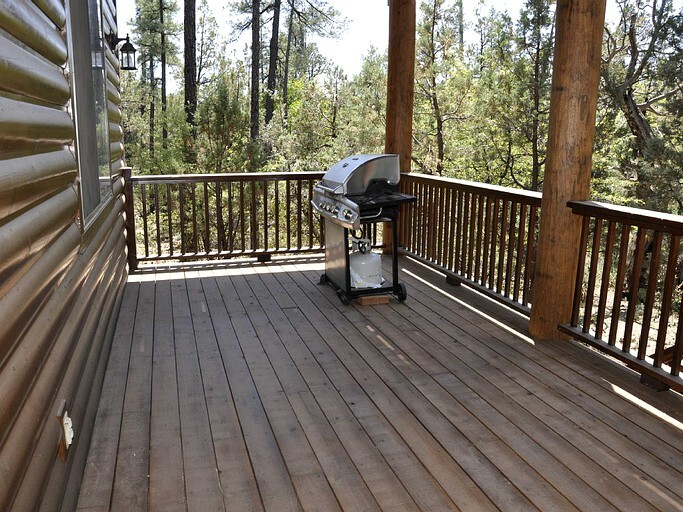 Outside, guests can enjoy the barbecue, situated on one of the three exterior decks. The 2.5-acre lot provides a vast amount of space to explore and plenty of room for parking. 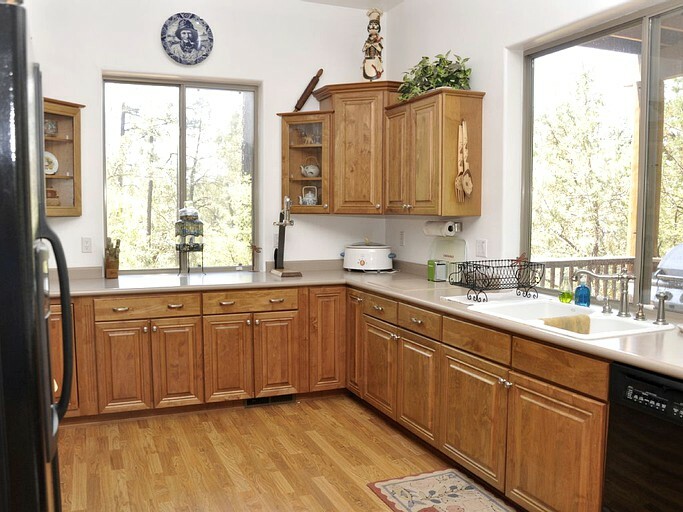 Payson, Arizona, has something to offer all year round, due to its stunning landscape, guests here will never get bored. 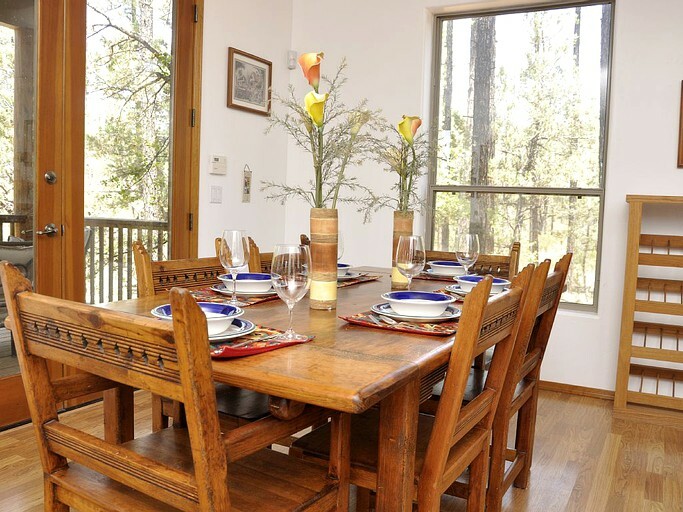 It is the perfect location for the outdoorsy type, with popular activities including; walking, fishing, boating, bird and wildlife watching, golfing, and swimming in the natural hot springs. For the more adventurous or sporty person, they can choose from horseback riding, mountain biking, rock climbing or hunting. Among the abundant array of outdoor activities, there is an endless number of nature trails for visitors to explore, suitable for all ability levels, and perfect for hiking, cycling, quad biking, and equestrian. With its impressive scenery, Payson can be enjoyed in the winter months too, with the option of cross-country skiing, sledding, and even snowmobiling. 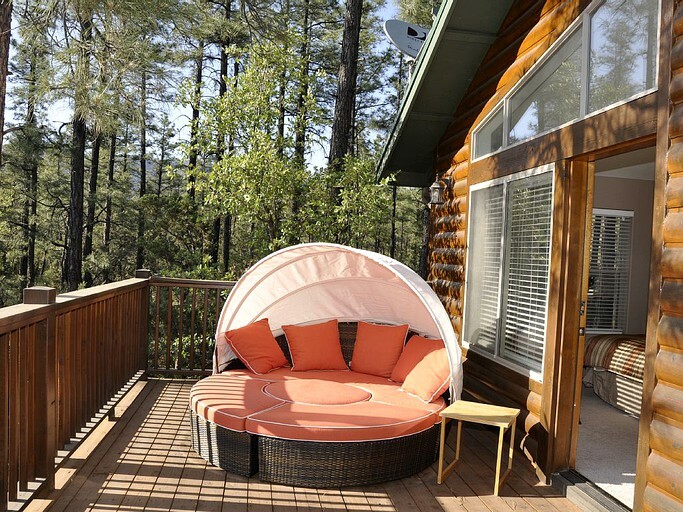 Something especially distinctive about the town of Payson is that it is classified as one of the only three pure air ozone belts, making it one of the best stargazing spots in the world. Local attractions which are definitely worth a visit, include the extraordinary Tonto Natural Bridge, the jaw-dropping Mogollon Rim and the Ellison Creek waterfall. 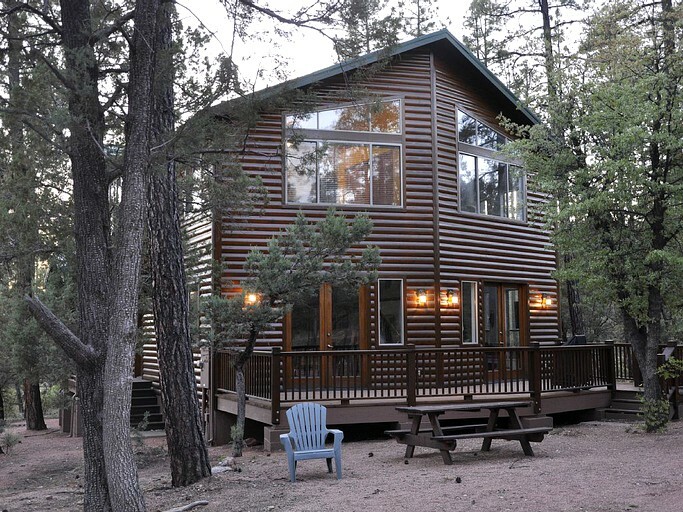 Travel a bit further out and guests can reach the iconic Prescott National Forest. Interestingly, Payson is the birthplace of Rodeo, the famous cowboy sport. This Rim Country tradition attracts tourists from all over for the Annual World's Oldest Continuous Rodeo. If guests fancy a night on the town, local bars and restaurants are just 15 miles away, or perhaps try out the Mazatzal Casino for some gambling fun. Children are welcome, and they will find plenty of activities to keep them occupied. This is a non-smoking property, and it is not pet-friendly. The minimum stay is three nights and rates vary for national holidays. This host requires a refundable security deposit of $500.